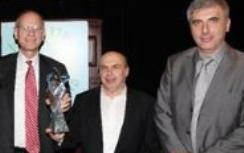 Jewish Agency Director Natan Sharansky presented the NADAV Fund’s first-ever Peoplehood Award to former U.S. Under Secretary Stuart Eizenstat for his contributions to the Jewish people and commitment to its future. The award was presented Monday at the General Assembly of the Jewish Federations of North America. During the term of office of former U.S. President Bill Clinton, Eizenstat led negotiations with Switzerland, Germany and Austria for the return of Jewish property to descendants of Holocaust victims, for the payment of insurance policies and for the location of bank accounts. In addition to serving in the State, Treasury and Commerce Departments, Eizenstat was the American envoy to the European Union. He also has been honored in the past by several European countries as well by Israel and the United States. He serves today as chairman of the Jewish People Policy Planning Institute (JPPPI), an independent Israeli non-profit think tank, whose mission is to help ensure the future of the Jewish people via professional strategic thinking and planning on issues of primary concern to world Jewry. The NADAV fund which presented the award to Eizenstat was founded in 2003 in part by Russian-born philanthropist Leonid Nevzlin, one of the sponsors of this year’s General Assembly. The Fund's activities aim at building a meaningful and pluralistic Jewish identity while creating lasting connections among Jews in Israel and the world over, particularly among young Jews.